Classic, Elegant high-quality Ladies Dressage Coat in perfect fit made of trans-elastic fabric with Teflon finish. This super-stretch Jersey fabric ensures a high degree of comfort and perfect freedom of movement. Lacquered buttons and three point and pocket squares colours supplied with the tails in grey, light pink and cream. 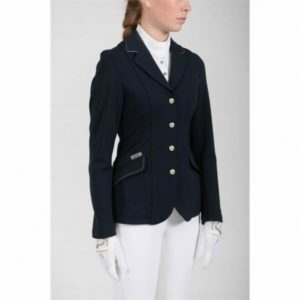 Stylish competition jacket from Pikeur with elegant details. Zip closure at the front and chic buttons inlaid with crystals. Made of elastic material for extra freedom of movement. Machine washable.